Modern life is generally understood to be monophyletic. It's united by the possession of RNA, DNA, cell membranes with distinctive chemical structure, a variety of amino acids (proteins), the metabolic pathways (that is, chemical reaction steps) for their processing, and the ability to replicate itself (not simply grow).1 Notice we said "modern" life - for who knows how many forms of molecular life arose, proliferated, and died out very early in Earth's history - before the thing that we now call "life" finally prevailed? 1. This statement is not strictly true, because viruses don't have intrinsic membranes, amino acids, and metabolic pathways (they hijack the molecules and mechanisms of the cells they invade), nor do they reproduce themselves; retroviruses don't even have DNA. The origin of viruses remains shrouded in mystery; but one hypothesis is that they lost these early in their evolutionary history. 2. But not the first. That honor is shared by two primitive chordates from Chengjiang, China, which are believed to be about 520 Ma. Figure 4.1. Pikaia gracilens, a presumed chordate from the Middle Cambrian of Canada. Figure 4.2. Two primitive chordates. (a) Cephalochordate (the lancet Amphioxus); (b) urochordate (the sea squirt Ciona); and (c) larval sea squirt. Cephalochor-dates (a) and urochordates (b) share with the vertebrates a host of derived features, including segmentation of the muscles of the body wall, separation of upper and lower nerve and blood vessel branches, and many newly evolved hormone and enzyme systems. The juvenile sea squirt (c) is free-swimming and has a notochord running down its tail. When it metamorphoses into the stationary adult, it parks on its nose and rearranges its internal and external structures. 1. Features of the throat (pharyngeal gill slits). 2. The presence of a notochord, a stiffening rod that gives the nerve cord support. 3. The presence of a dorsal, hollow nerve cord. 4. Upper and lower muscle masses, repeated en echelon, like a series of "V's". This distinctive suite of characters - pharyngeal gills, notochord, and nerve cord - appears to have evolved only once, thus uniting these animals as a monophyletic group. We see Chordata and its diagnostic characters at the base of the cladogram in Figure 4.3. We - and the dinosaurs - appear to have chordate relatives as far back as the Cambrian. 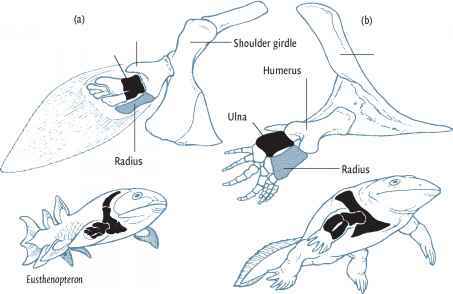 Most interesting for us, within Chordata is also found the familiar Vertebrata (vertere - to turn). 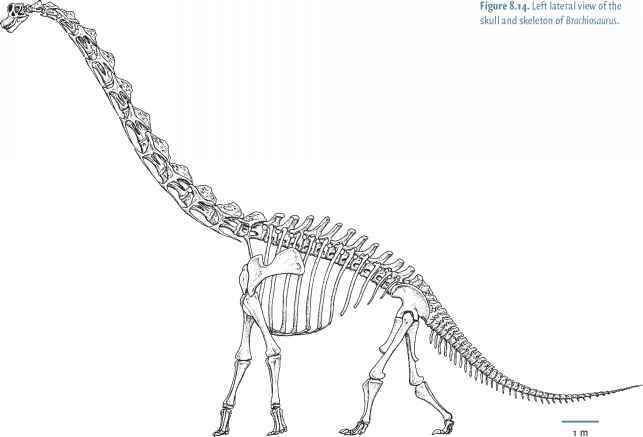 The diagnostic characters of vertebrates, with one exception, include a calcified internal skeleton (that is, bone) divided into discrete pieces called elements,3 and a variety of other characters (see Figure 4.3). 3. In anatomy, the word "element" confusingly has a different meaning from its meaning in chemistry (see Chapter 2 and Glossary). Figure 4.3. Cladogram of the Chordata. Because this is a book about dinosaurs (and not all chordates), we have provided diagnoses for only some of the groups on the cladogram. Bars denote the shared, derived characters of the groups. The characters are the following: at 1, pharyngeal gill slits, a notochord, and a nerve cord running above the notochord along its length; at 2, segmentation of the muscles ofthe body wall, separation of upper and lower nerve and blood vessel branches, and new hormone and enzyme systems; at 3, bone organized into elements, neural crest cells, the differentiation ofthe cranial nerves, the development of eyes, the presence of kidneys, new hormonal systems, and mouthparts; at 4, true jaws; at 5, bone in the endochondral skeleton; at 6, ray fins; at 7, distinctive arrangement of bones in fleshy pectoral and pelvic fins (see Figure 4.4); at 8, skeletal features relating to mobility on land - in particular, four limbs. Consistent with a cladistic approach, only monophyletic groups are presented on the cladogram. Some ofthe groups may not be familiar: for example, Cephalaspis and Eusthenopteron are not discussed in the text. Cephalaspis was a primitive, jawless, bottom-dwelling, swimming vertebrate, and Eusthenopteron was a predaceous lobe-finned fish, bearing many characters present in the earliest tetrapods. Cephalaspis and Eusthenopteron are included here to complete the cladogram as monophyletic representatives ofjawless vertebrates and lobe-finned fishes, respectively. Among Vertebrata, we're naturally interested in the subset Gnathostomata (gna-thos - jaw; stome - mouth), vertebrates with true jaws (among other diagnostic features). So, who are these gnathostomes? Well, we are certainly including, in addition to most of the vertebrates that might come readily to mind, a bewildering variety of fishes. But rather than be bewildered, we'll focus directly on the subset of gnathostomes that we call the bony fishes. Here, now, is a major split in the cladogram, representing a major evolutionary branching point. On the one hand is the lineage of bony fish (Osteichthyes; osteo - bone; ichthys -fish) leading to familiar forms such as goldfish, tuna, and salmon. 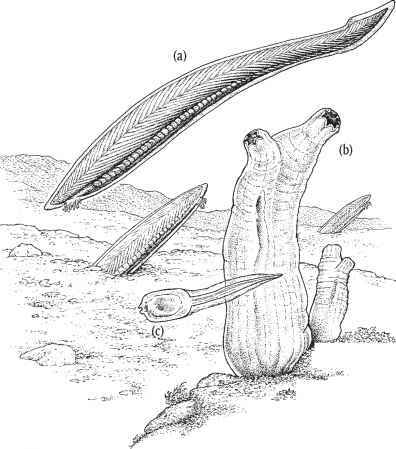 But on the other branch is Sarcopterygii (sarco - flesh; see Figure 4.3), a not-so-familiar group that is diagnosed by, among other things, the presence of distinctive lobed fins, fleshy places where the fin attaches to the body. Figure 4.4. Some homologous features between lobe-finned fishes and tetrapods. (a) The shoulder girdle of Eusthenopteron, an extinct lobe-fin; (b) the shoulder girdle in early tetrapods. Because aspects of the forelimb in different early tetrapods are incomplete, the forelimb shown here is a composite prepared from two early tetrapods (Acanthostega and Ichthyostega). Key homologous bones are labeled in both drawings. Generalized primitive tetrapod pod - foot): vertebrates with four limbs, including dinosaurs and ourselves (Figure 4.4). What's more, bones of the pelvis, vertebral column, and even bones in the skulls of lobe-finned fishes can also be recognized within tetrapods. All these diagnostic characters strongly indicate that it is here, among the lobe-fins, that the ancestry of Dinosauria - as well as our own ancestry - is to be found (Box 4.1).